Welcome to our English for Healthcare study program used by hospitals, universities, government training programs, teachers, and self-study students. It was built to be fun, fast, and easy-to-use. One user has even called it "amazing". Speaking, Listening, Writing & traditional Gap fill activities where students can compete with classmates or other students worlwide. Our reponsive design works on any device: tablet, smart phone, PC or Mac. We eliminate technical hassles. We offer your students a globally recognized IT English certification. Cobranding available. Cobrand our program using your logo and branding. You can even run it on your own subdomain, so students never have to leave your domain. Our course is written by IT professionals and edited by certified EFL teachers. This is not a re-hashed general English course. Students require only B2 (Advanced Beginner) level or higher to succeed in English 4 IT. Use our API to integrate our program into your LMS (learning management system), curriculum, or study program. Our virtual classrooms offer discussion forums where teachers can communicate and monitor their students progress. Students who complete 15 units will receive a digital printable certificates which can be verified online via QR code technology. 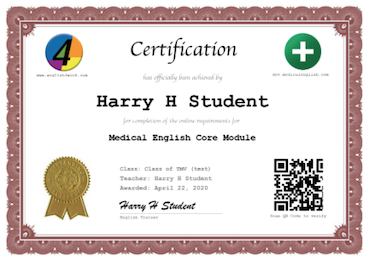 MedicalEnglish.com includes a wide range of activities. All that's needed is a Web browser and an Internet connection. It even works on smartphones supporting html5. What level are the course materials? Our course material is rated at levels B2, C1, and C2 on The Council of Europe Language Level Scale. Teachers can customize and assign their own class-specific certificates. What do users say about MedicalEnglish.com? "I just finished a unit of the course and find it amazing." Try MedicalEnglish.com Now For Free! Get the first two units FREE! Just create an account to begin.